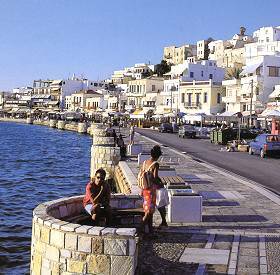 The capital, the main port and the biggest shopping center of Naxos. It has around 8000 inhabitants and has been subject to constant change since the tourist invasion began. As you arrive at the harbour you will see the immense marble portal called the Portara, on the islet of Palatia. Joined to the main island by a causeway, it is the ancient entrance to the temple of Apollo, which was begun in the sixth century BC but never finished. It is definitely worth a visit, particularly at sunset. Naxos harbour is dominated by a conical hill, topped by the ruins of an impressive Venetian Kastro. Around it are multitudes of high, cube-shaped buildings that extend like giant steps down to the seafront. Unfortunately this sight is now somewhat marred by the modern construction work going on. The whole scene is seething with huge numbers of tourists, and there are loads of cafes, restaurants and travel agencies in the town. There are four main areas of the town - the harbour, around the kastro, Grotta (about 10 minutes walk from the town centre) and Agios Georgios beach (the latter is where most of the hotels and accommodation are concentrated), all of which have something different to offer.